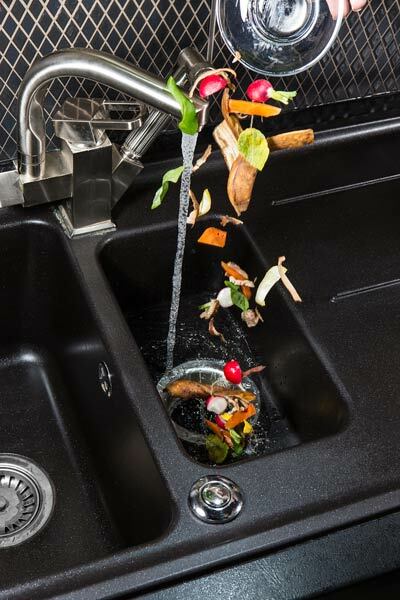 How to Keep Your Garbage Disposal "Healthy"
Garbage disposals are kind of magical, aren't they? You just throw your food scraps down there and they get chopped up and washed away without ever rotting and taking up room in your trashcan! But as with anything, there are some tips and tricks to keep things running smoothly, and some things to know so you can avoid a disaster. We're here to fill you in on all the garbage disposal "dos" and "don'ts" so you can keep choppin' without stoppin'. Keep it running. This is kind of like the saying, "If you don't use it you lose it." Frequent use of your garbage disposal keeps rust, corrosion, and buildup at bay so it can keep it working it's magic for years. Keep it cold. We don't suggest you drain any fats, oils, or grease down your disposal, but using cold water will cause any of these that accidentally get washed down into the unit to solidify so that they can be broken down by the blades before reaching the trap. Keep it small. You don't want to overwork your disposal, so be sure to cut up larger items rather than put them down whole, and only throw down small amounts of food at a time rather than everything all at once. Keep it flowing. Don't turn your garbage disposal off until you know everything has been thoroughly chopped up and washed away, and even when that's done and you've turned the actual disposal off, pour a little dish soap down the drain and keep the water running for about 10 seconds to make sure any rogue bits are flushed out of the pipes. Throwing down strings: What do celery, artichokes, asparagus, lettuce, corn husks, carrots, onion skins, and potato peels all have in common? They're stringy and can wrap around your garbage disposal blades, which can have seriously negative effects on the motor. These items are all far better off going into your trash can or compost bin. Throwing down FOG: Putting fats, oils, and grease (FOG) down your garbage disposal causes a whole host of problems. They coat the blades making them less effective, they cause clogs when they solidify, and they eventually rot and stink up your whole kitchen. Instead, pour the liquified FOGs into a separate, disposable container while they're still hot and then throw out the container with the regular trash once it's full. Throwing down coffee & eggs: Well, coffee and eggs themselves are fine, but coffee grounds and egg shells are bad news. Both coffee grounds and broken down egg shells are gritty and can get trapped in existing FOG clogs contributing to the ever growing problem. These items are natural and biodegradable, so they're perfectly safe to compost or throw away just like your "stringy things." Throwing down "time bombs:" Pasta, rice, potatoes, and beans all certainly seem fine to put down the disposal, but each of these foods expand when mixed with water. And not only do these foods grow bigger over time, but they all form a glue-like glob that will to enough damage on it's own until you remember the previous bullet point where we mentioned how things get stuck in blobs like this, and realize how your plumbing problems can go from bad to worse very quickly in such a "sticky situation." Again, your compost bin and your trash can are your friends. Throwing down non-food items: There are so many food items that aren't garbage disposal appropriate, so don't even think about putting any non-food items down there. The water and blades that can get rid of the bowl of leftover chili you forgot you had in your fridge are simply not enough to break down non-food materials like plastic, glass, rubber, bone, etc. Trust us, you, your plumbing, and your wallet are better off throwing these items in the trash or your recycling bin. Throwing down chemicals. You may think you can get away with putting whatever you want down your garbage disposal as long as you throw some drain cleaner down after it, but unfortunately you'd be wrong. These chemicals don't actually work, can corrode your blades and pipes, and are dangerous for you to breathe. To clean your garbage disposal, all you need is a little dish soap and cold water like we mentioned earlier. Side note: If you call your plumber for help and have recently used a chemical cleaning agent, please let them know so they can take the proper precautions to stay safe. Speaking of calling your plumber... If you're having trouble with your garbage disposal and are looking for help, give Ken’s Plumbing a call! You can reach us by phone anytime at (864) 242-5511, or click the banner below to schedule service online. You can also fill out our contact form to ask our professionals even more about what items are or are not safe to throw down the drain!